On June 3 at precisely 8:30pm, a peal of 2,000 hand bells will ring out over the slopes below St. Joseph's Oratory in Montreal, marking the opening of The Millennium Symphony, a mammoth outdoor musical happening. For Walter Boudreau, head of the Société de musique contemporaine du Québec, it will be the most important musical gathering of his life. The media in general have focussed on this aspect of the performance, but this is only one side of the coin. The reverse side reveals what amounts to an enormous musical jigsaw puzzle, collectively created by a total of 19 composers, each assigned to one of the participating ensembles. 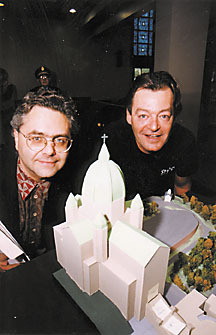 Composer Walter Boudreau is the mastermind of the work, along with project co-director and close associate, composer Denys Bouliane. Individual participants include John Rea and Gilles Tremblay among the older generation, Jean Lesage and Estelle Lemire among the younger, and composer-performers such as Anthony Rozankovic and André Duchesne from the jazz and musique actuelle scenes respectively. Given the wide range of composers and performers involved, the inevitable question arises: since there are as many artistic visions as individuals in this project, how is it possible to make them all work together? "We had to invent a code," says Boudreau. "It would have been unthinkable to get all the composers together without any prior planning. Rather than impose rigid rules or tell them how they should compose their respective sections, we tried from the outset to suggest guidelines to help us find a common ground." To do this, Boudreau proposed a Gregorian chant as a main theme -- "Veni Creator Spiritus." It is heard at the beginning and end of the work, and is interwoven with the music throughout, each composer transforming it. The choice of theme is unusual, Boudreau admits. He has a personal preference for this piece of music, but was also attracted by its simplicity and the way the melody line lends itself to various rhythmical and harmonic variations. (See chart.) Those who listen closely will also hear elusive references to Mussorgsky's Boris Godunov. Note that the third movement takes up half of the symphony's 90 minutes -- not inappropriate when one considers the history of humanity in all its excesses. "With this initial structure we were able to prepare a more detailed blueprint in which all the musical elements were calculated down to the last second. We put all the data into our studio computers," Bouliane told us as he scrolled through the work on screen. "Printing out the file required at least 35 feet of paper!" 7. Statement and restatement of the cantus firmus over the work's entire length. Two of these seven criteria need some explaining. The first establishes the various roles assigned to participating ensembles. A given group might take the lead and fill the role of soloist, with or without the assistance of other groups. The entry of a solo group can be independent (without reference to the music that precedes it) or dependent (referring to the preceding music). Groups may, however, perform together on a fairly equal footing, with one filling a main or subordinate role while a second performs in the independent or dependent mode described above. In a third scenario, the tutti instruction indicates that one ensemble will take the lead while the rest are subordinate, as happens at the end of the work. And who will take the lead in the symphony's grande finale? You'll have to be there to find out! The sixth criterion, "spatialization," describes how the music will move in space within the performance area. For example, in the second movement (Hell) the music moves progressively and in an increasingly erratic manner from the centre toward the periphery of the area. In the fourth movement (Contemplation), the music moves initially from the centre to the periphery, then returns to the centre. The effect is akin to the "surround" sound much favoured in top-of-the-line stereophonic systems. Boudreau has promised us a similar experience which he describes in French by the somewhat whimsical term of "toutpartoutphonie." The orchestration of the symphony's various elements is almost complete, and a copyist is now hard at work producing all the scores for no less than 333 musicians. "The number is pure coincidence," says SMCQ press attaché Suzanne Samson, who admits it is surprising all the same, and that "we counted them several times to make sure, and got the same figure every time." Note: At the time of writing, 1,200 of the 2,000 bells had been sold. Three models are available. For details contact the SMCQ at 514 843-9305 or go to the SMCQ website at www.smcq.qc.ca. The concert will take place June 4 at 8:30pm if cancelled due to rain the previous evening. 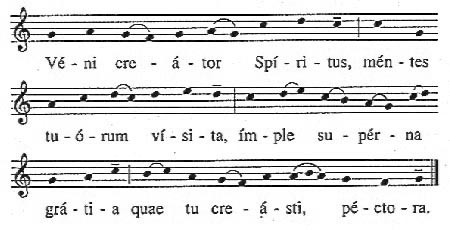 The Veni Creator Spiritus, a liturgical hymn for Pentecost, is among the best known sacred music of the Christian tradition. Its origins can be traced back to the ninth century, but it may have roots in the music of ancient Greece. Following the translation of the Latin text by Martin Luther, composers such as Bach and Buxtehude used it in their organ works. This Gregorian chant is used as the theme of the Millennium Symphony, and is a form of springboard for the composers involved in this collective enterprise. Gilles Tremblay, one of the senior composers working on the project, has decided to use only children's voices in the ensemble assigned to him - Les Petits Chanteurs du Mont-Royal. The children will imitate peals of bells in the third movement and hum folk music as thematic variations in the fifth movement. These are known in Quebec folklore as "Turlutes." Pianist Anthony Rozankovic, one of the younger composers involved, has focussed on the rhythmical aspect for his contribution, inspired by ethnic music such as the Brazilian samba, in order to provide a more syncopated approach. "I made this decision fairly quickly," he says. "I found it all the more interesting because I had been assigned the band of the Royal 22nd. A military band is accustomed to playing music in which the straightforward downbeat is a major element. I decided to get them marching on the other foot, as it were." We asked the two composers what they thought of the symphony. Tremblay sees it as "a great tapestry and a 'popular' work in the best sense of the word." Rozankovic compares it to a "'We Are The World' by 19 composers" type of work. He likes the Gregorian theme. In his view, "It's a melody that deserves to be better known." ­ Marc Chénard / J.B.